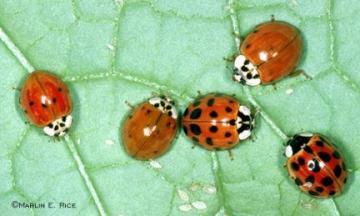 The multicolored Asian lady beetle (Harmonia axyridis), has become common throughout the United States and all of Iowa. It is well known for the annoying habit of accumulating on the sides of buildings and wandering indoors during the fall. Asian lady beetles are a beneficial biological control in trees during the summer, and in fields and gardens during the fall, but can be a severe household nuisance during late fall and winter. Wooded residential and industrial areas are especially prone to problems. The origins of the Asian lady beetles are not clear, although it appears the current pest species was not purposefully released in the United States or in Iowa. Beetles that arrived by accident in ports such as New Orleans in the late 1980s have crawled and flown all by themselves to all corners of the country. The multicolored Asian lady beetle is 1/3 inch in length; dome-shaped; yellowish-orange to red with variable black spots on the back. Deep orange is the most common color. The 19 black spots may be faint or missing. There is a black “W” shaped mark on the thorax. Asian lady beetles, like other accidental invaders such as the boxelder bug, are "outdoor" insects that create a nuisance by wandering indoors during a limited portion of their life cycle. They do not feed or reproduce indoors; they cannot attack the house structure, furniture, or fabrics. They cannot sting or carry diseases. Lady beetles do not feed on people though they infrequently pinch exposed skin. 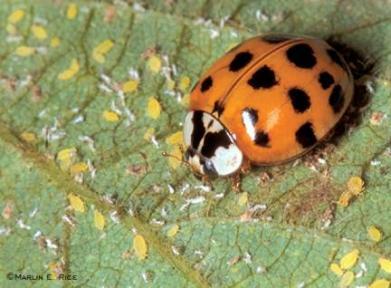 Lady beetles may leave a slimy smear and they have a distinct odor when squashed. Asian lady beetles follow their instinctive behavior and fly to sunny, exposed surfaces when preparing to hibernate through the winter. The time of beetle flight varies but is usually from mid-September through October (depending on weather). Light colored buildings and walls in full sun appear to attract the most beetles. Sealing exterior gaps and cracks around windows, doors, eaves, roofs, siding and other points of access before the beetles appear can prevent unwanted entry. Experience suggests, however, that comprehensive pest proofing is time-consuming, often impractical and usually not 100% effective. For large infestations with intolerable numbers of beetles, spraying pyrethroid insecticides such as permethrin or esfenvalerate to the outside of buildings when the beetles appear may help prevent pest entry. Homeowner insecticides other than pyrethroids usually do not provide satisfactory prevention. Long-term relief may come from planting trees that will grow up to shade the south and west sides of the house. The most practical control for beetles already inside is to vacuum or sweep them up and discard. Indoor sprays are of very limited benefit. Interior light traps are available. When lady beetles stranded indoors for the winter are emerging from inside house walls, there is no control option more practical or effective than repeated vacuuming. Spraying insecticides has little or no effect. However, one alternative for homeowners unable/unwilling to pursue wintertime ladybug control via vacuuming is the use of lady beetle traps as indoor collecting devices. Traps are not designed to kill lady beetles but rather to collect them for removal from the building. The traps use a light to attract the lady beetles at night. Black light bulbs work best, but incandescent light bulbs will also work. Light traps can be purchased from companies that sell insect collecting equipment, or you can make your own. Basically what you will need is a light fixture with a funnel below it that funnels the beetles into a container from which they cannot escape. A simple design for a light trap can be found online at Ohio State University Extension. Additional photos of lady beetles can be found here. Multicolored Asian Lady Beetle FAQ’s: All Your Questions Answered! !